For the first time! Episodes 25-48 of the epic action-adventure series packaged in one Blu-ray box set for your enjoyment. 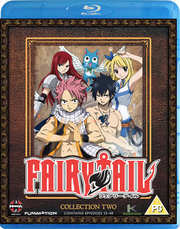 Across the Fiore kingdom, wizards join guilds and make their pay by filling magical needs - but one guild has a reputation as the roughest, rowdiest, most dangerous of all: Fairy Tail! In the midst of a mission to break the curse over Galuna Island, Natsu and the gang face a band of deranged mages trying to resurrect the monstrous demon Deliora. Gray's determined to put the freeze on the sinister plan in a frigid battle with a rival from his past - even if it takes his own life! Back in Magnolia, the city becomes a warzone after sorcerers known as Element 4 destroy Fairy Tail headquarters and kidnap their beloved rookie, Lucy. A bone-crunching, skin-charring fight between fire and iron erupts when Natsu squares off against another Dragon Slayer wizard!